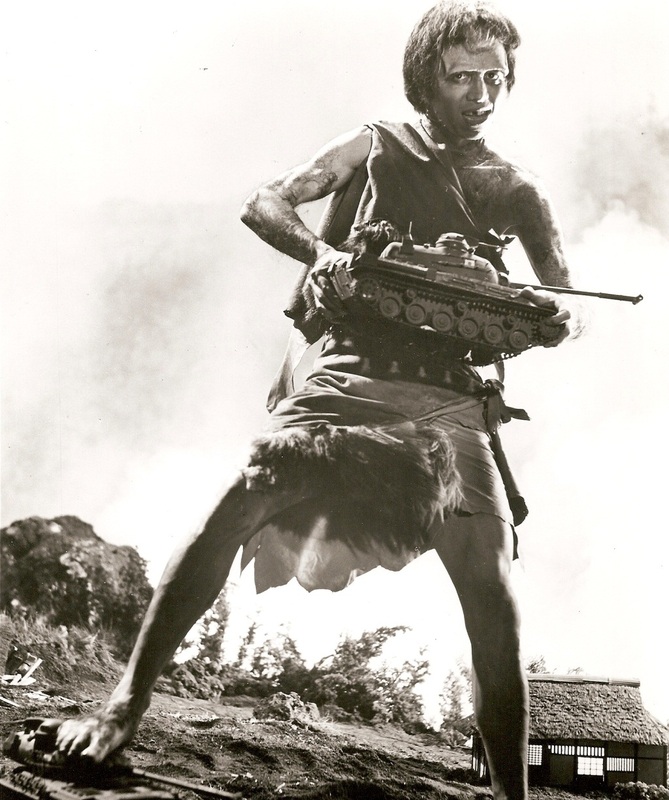 I totally like the more accurately descriptive, Japanese title for this better: Frankenstein Versus Subterranean Monster Baragon. You'd think that a movie combining two of my favorite things - Frankenstein and giant monsters - would be something I'd enjoy, but alas: not so. Like Frankenstein Meets the Space Monster, I've only ever been able to get through this via judicious fast-forwarding. At least it actually features a Frankenstein Monster of sorts. Using the Axis alliance as a springboard, the film opens with the Nazis appropriating the heart of the Frankenstein Monster from a European scientist who's been studying it, then has them ship it to Japan for further research. The Japanese are studying it in Hiroshima when the Allies destroy the city and the immortal, radioactive heart lies dormant under the rubble for years until it begins to grow a new body. As with all radiation-affected creatures in these movies, the new Frankenstein Monster continues growing until he's Godzilla-sized and ready to go to battle against a burrowing, bat-eared, horn-nosed giant reptile.This version of the Monster pays some homage to Universal's without getting too close to it. It spawned one sequel, War of the Gargantuas, in which the Monster's cells mutate further and create two versions of itself: a good one and an evil one. Meanwhile, Baragon went on to much greater success joining Godzilla in several of his movies. In the early '60s Dell did a series of one-shots adapting Universal's most popular monster-movies: Dracula in 1962, then Frankenstein and The Wolf Man both in 1964. A couple of years later though, the monster craze still being very big in the US, they decided to turn the characters into superheroes. Dracula and Frankenstein were no problem as long as Dell didn't use the Universal likenesses. They even continued the numbering from the one-shots, starting the superhero versions with #2 issues. Since the Wolf Man name was trademarked by Universal, Dell renamed that series Werewolf and started with a new #1. 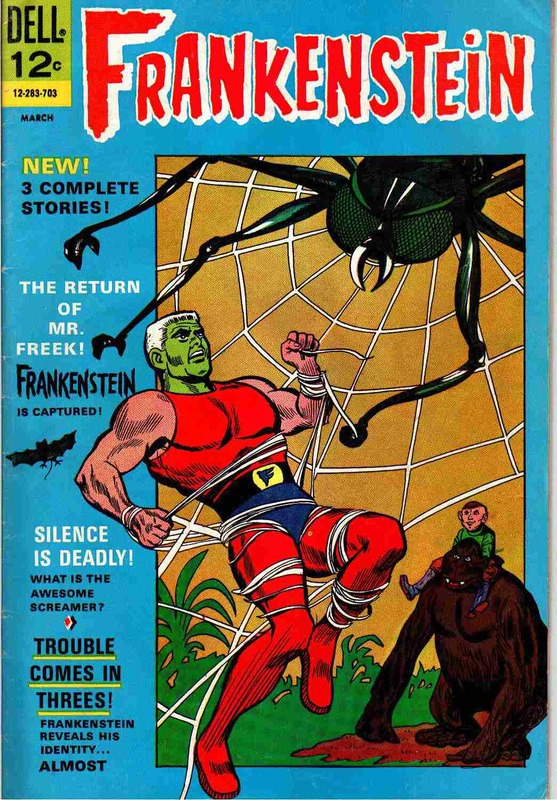 Chris Sims did a great write-up about all three series for Comics Alliance last Halloween and describes the Frankenstein one as "What If Batman Was Frankenstein." 31 Days of Frankenstein: Mad Casino Party? 31 Days of Frankenstein: Kiss Me, Herman!